In 1569 the unmarried courtier, Sir Henry Lee, had the idea that Elizabeth I’s accession day on 17 November (1558) should be specially celebrated at the court with great jousting or tilting. By the 1580s these Accession Day tilts had become an important occasion for the queen’s young knights to show their prowess and their skills with arms. 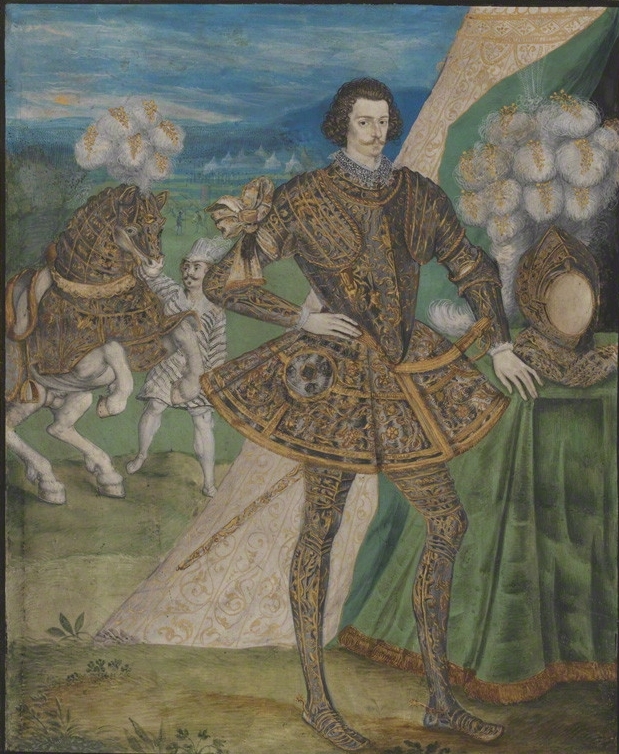 Nicholas Hilliard painted his patron the Earl of Essex full-length in tilting armour, in a miniature. It shows him at the Accession Day of 1595, his armour showing diamonds within a circle, a personal emblem of Essex. 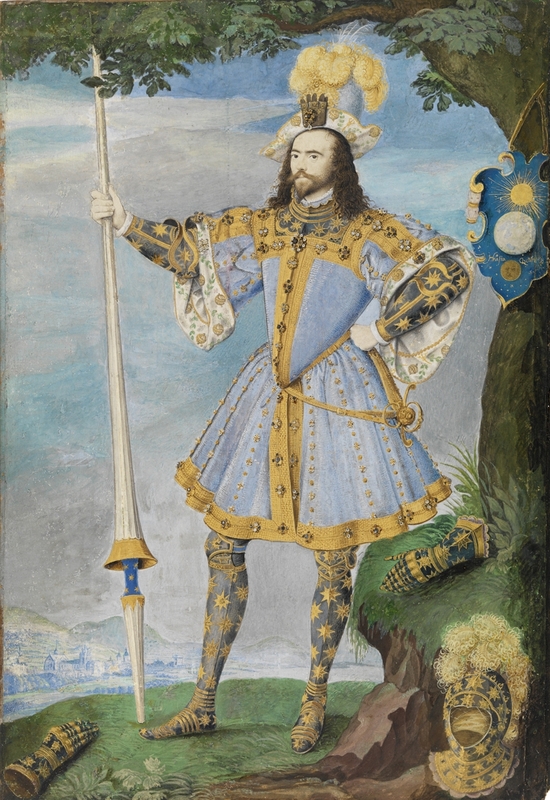 The seafaring knight, George Clifford, 3rd Earl of Cumberland, was also portrayed in tilting armour by Hilliard, although his looks more like fancy dress. However, this effect is caused by the elaborate tabard or surcoat he wears over it; his armour proper would have been the most beautiful at court as Clifford acted as Queen’s Champion during the 1590s. The Hilliard miniature shows him with the queen’s glove – her “favour” – pinned to his hat. Essex’ intellectual brother-in-law, Henry Percy, 9th Earl of Northumberland, became known as “the Wizard Earl”. 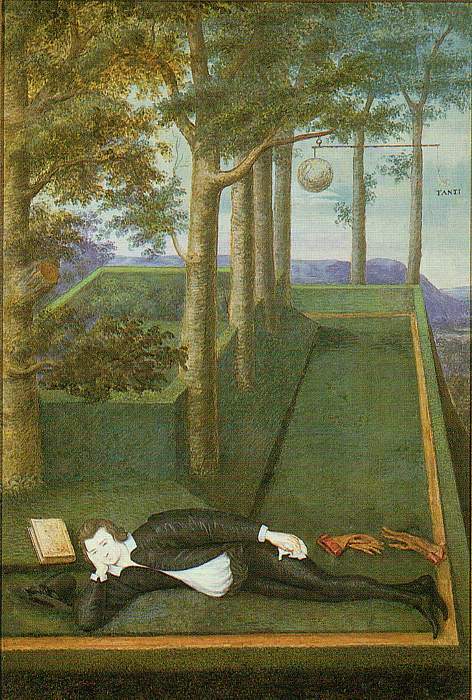 Whether his melancholy was aggravated by his unhappy marriage to Dorothy Devereux or not, he found solace in scientific experiments, and another miniature by Nicholas Hilliard depicts him in a pose which seems to hint at exactly these two themes – science and melancholy. The earl managed to keep clear of the Essex conspiracy, only to be entangled (by association) in the Gun Powder Plot; he spent 17 years in the Tower, where he had plenty of time for his scholarly pursuits. Hilliard’s pupil Isaac Oliver became ever more successful in the late 1590s and under James I gained royal patronage. 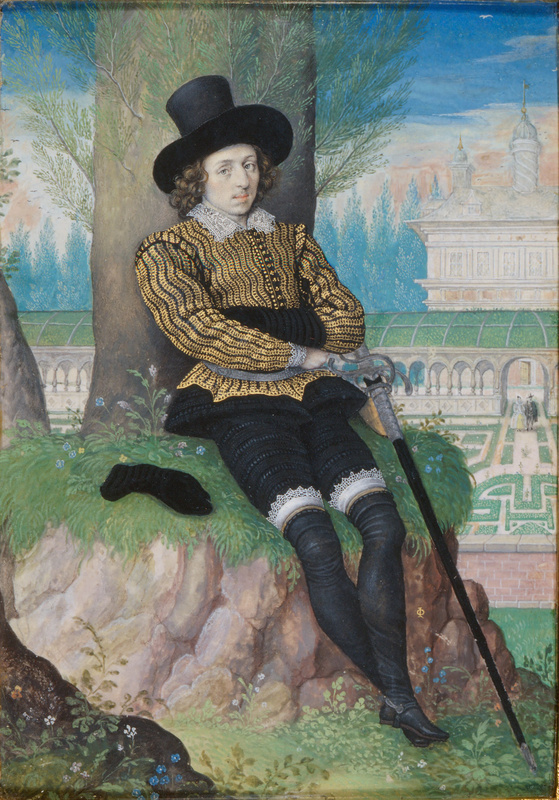 The melancholy youth was still en vogue, as shown by his Young Man Seated Under A Tree. The Oxford scholar, Robert Burton, even combined melancholy with science in his 1621 book, Anatomy of Melancholy. Aston, Margaret (1996): The Panorama of the Renaissance. Thames & Hudson. This entry was posted in Elizabeth I, paintings and tagged chivalry, Dorothy Perrot, Earl of Essex, Earl of Northumberland, Henry Lee, Isaac Oliver, melancholy, Nicholas Hilliard. Bookmark the permalink.